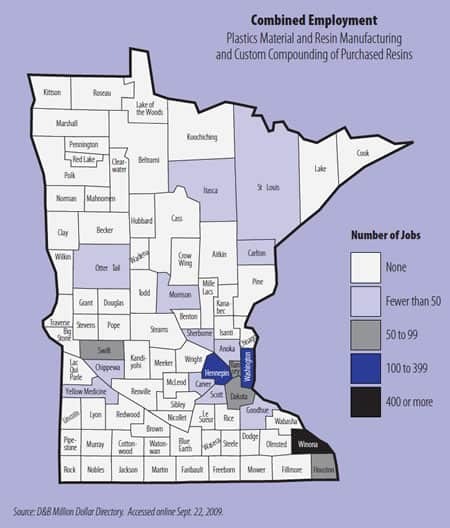 So why is southeastern Minnesota such a hot bed of composites activity? The answer lies largely in the history of the Winona manufacturing sector. A timeline of composites development compiled by the Winona Area Composites Consortium reads like a complex family tree, the roots of which reach back to the Miller brothers. In 1947, Ben and Rudy Miller, who owned a textile wasteprocessing business called Miller Waste Mills, founded Fiberite Corp. and started their work with cotton fabric reinforced phenolic compounds. Since that time, the Millers, various business partners, their employees and others with some connection to important figures in the Winona area composites industry—names like Stan Prosen, Ron Hawley, Mike Cichanowski and Steve Bowen, to name a few—have developed and spun off more than a dozen composites companies that specialize in everything from violin bows and canoes to applications in vehicle, energy and aerospace sectors. Cichanowski, who has been building canoes in the area since his days as an Eagle Scout, founded We-no-nah Canoe, the world’s largest manufacturer of Kevlar canoes and the second largest manufacturer of Royalex canoes. Along with making canoes from composite materials, the company is a leader in developing materials and manufacturing processes. In fact, many area companies were launched when someone at an existing company developed a new process or technology, hoping to gain a competitive advantage. So it surprises some people that Winona area composites manufacturers (along with companies from surrounding Minnesota and Wisconsin communities) are members of an industry consortium. What started companies is to develop their own local talent.